The new Woolworths Catalogue is bursting with deals. A lot of different products from different categories are featured in the catalogue. Christmas is also an important category regarding the treats such as chocolate boxes on sale. In the snack sale you have chips, cookies, soda packs and more on pg 2-3. Loacker chocolate biscuits will cost only $2 saving your $2. Half price sale is an important part of the new catalogue. 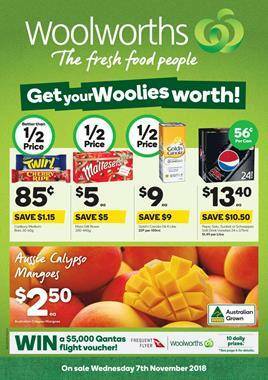 Half-price deals on Maltesers, Cadbury Twirl, Cherry Ripe, Gold'n Canola are promoted items on the first page. Browse Christmas treats on pg 4-5. Prepare a treat bag for everyone. It's a pleasure to do something related to the celebration of something like Christmas. Especially when it comes to a merry subject. Buy M&M's, Cadbury favourites, Maltesers, cookies and more products at half prices. All of them are limited stocks. Breakfast food such as Just Right, Nutri-Grain, Weet-Bix and more on pg 6.